But enough about my lack of abilities in the kitchen, let’s get to the actual recipe! 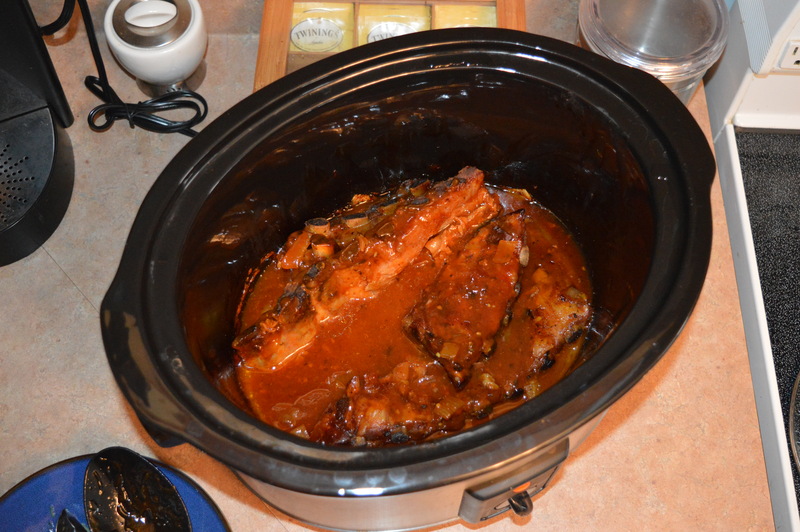 This is a slight variation on my mom’s crock pot ribs. Really, I may have just changed the sauce that was used but whatever… Every time I bring out my crock pot I kick myself that I don’t use it more often! It’s so nice just being able to throw some ingredients into it and just let it be. 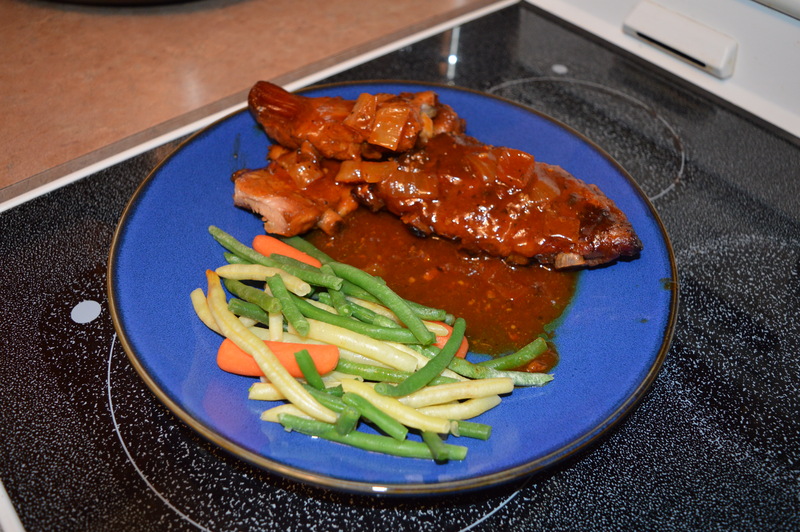 I don’t need to be in the kitchen for long periods of time and food always tastes better when it’s cooked low and slow. 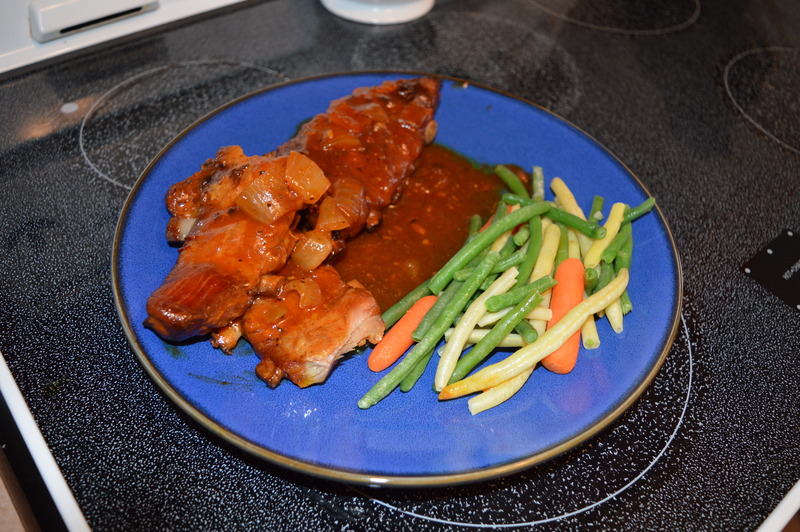 Cut the pork side ribs into smaller sections. 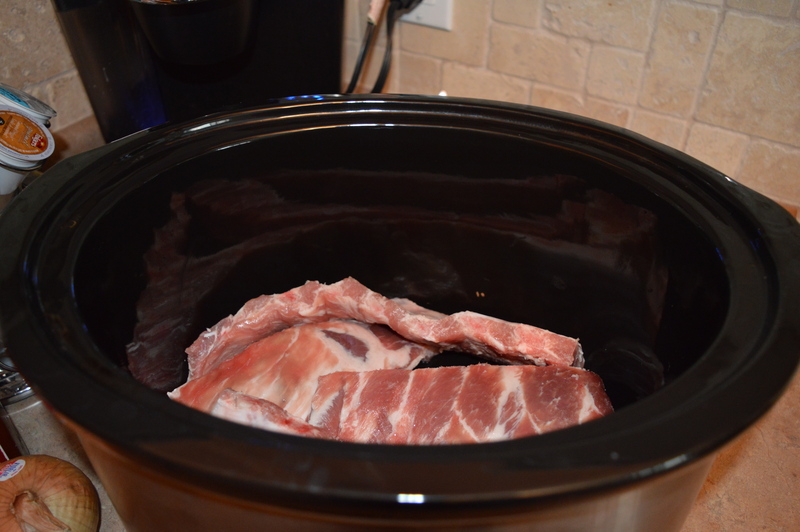 I cut mine in halves but depending on the size of your crock pot you may need to cut them into thirds. Next sprinkle the desired about of garlic seasoning you’d like. I don’t actually have an exact measurement for it. I usually just eye ball it and tend to go on the heavier side because Kurt and I are garlic lovers. The seasoning I used is Club House Garlic Plus. It also has black pepper corns added into it. Feel free to play around with the spices. This is just what I use in ours! Next, roughly chop the onion. I think it’s better to have larger pieces in this recipe because they will cook down a lot and become hardly noticeable. Finally, add your favourite sauce over all the ribs. I like to use Diana Chicken and Rib BBQ sauce because it has a sweet yet tangy taste to it but feel free to use whatever your family prefers. 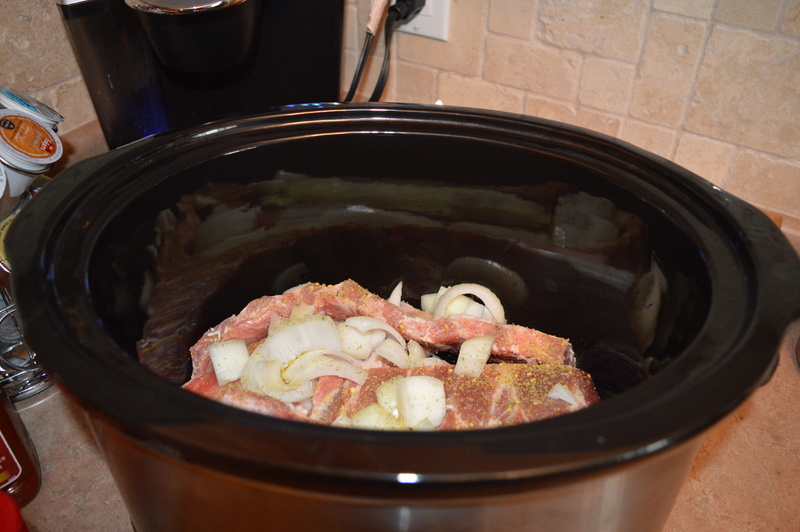 Turn your crock pot onto its lowest setting and cook for roughly 5-6 hours. 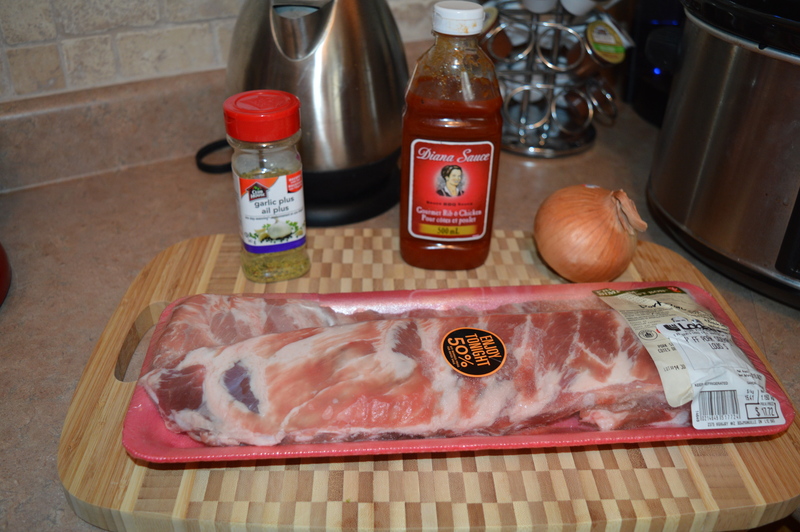 Depending on what time I start my ribs at, I some times cook them on high for 3-4 hours. I usually like to give them a couple flips throughout the day as well. 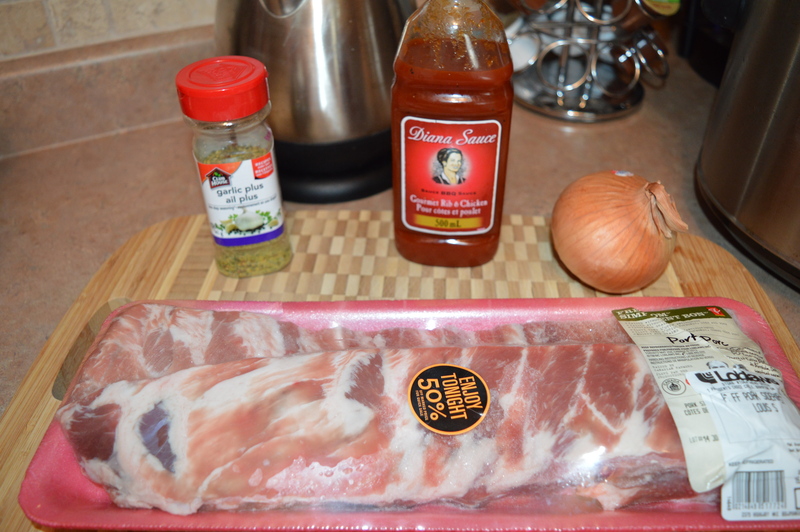 This way I can coat the ribs in the sauce and they don’t dry out. Typically, I’d put more of an effort into making a side dish to pair with the ribs (like my cheesy mashed potatoes) but since Nate is teething, he’s been SUPER sucky lately and yesterday he just wanted to cuddle and snuggle so I just opted to make some simple steamed veggies.